Here’s a quick quilt block you can make with 5″squares. 1. Sew 9 of your 5″squares together. First sew together three rows of three blocks, iron flat, and then sew the three rows together to get your nine patch. Press flat. 2. Cut your nine patch in half vertically and horizontally. You really should measure where the exact middle is, but if your baby is going to wake up any minute and you have 11 more of these to cut…….your allowed to eyeball it. 3. Now you have four 7″ blocks. Re-arrange them however you like. The possibilities are endless with these blocks, I made my blossoms baby quilt by sewing these together to make the quilt center. 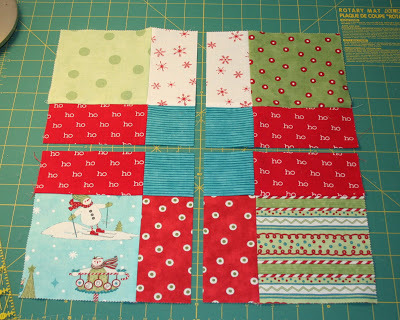 Or you can put white sashing (borders) around each block, or a set of blocks, like I’m doing with this quilt. A nice pile of blocks waiting to be arranged. I love the disappearing nine-patch. I did one not too long ago. I like your arrangement of the block. I tried this out with a wild Alexander Henry print and love the results! Very rewarding for a beginner quilter such as myself…. OH…MY…GOSH…I love your blog and I LOVE these instructions!!!!!! I had NO idea that's how you would make one of these cute quilts – I'm totally going to do this with some Farmer's Market fabric I've been waiting to use! Thanks so much!!! That's a really need idea.. I like the cheesecake at the end!! 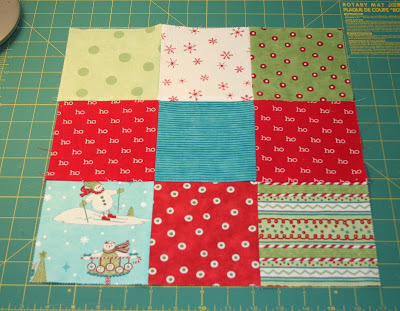 This block was sooooo easy to make! Thanks! I may need to make this quilt! That cheesecake looks awesome. Where'd you get it? That is insanely simple. I have been doing Crazy Eights and it is driving me insane! You inspired me to make this quilt, so I did! finished now and looks adorable! So easy. Thanks! I made a disappearing nine patch with that same fabric. That is just too funny. Forget about the quilting…let's talk about that cheesecake! YUM! Actually I do love the D9P block, but who can resist chocolate cheesecake? Not me! Thank you so much for these instructions! 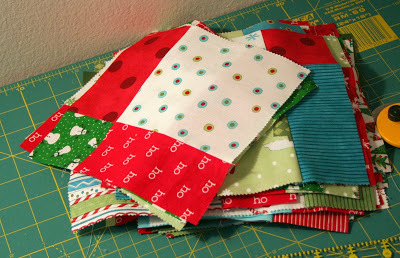 I just used them to make my Sherbet Pips layer cake into a quilt top. Looking good thanks to you. Ah, I've been looking at disappearing nine-patch blocks for ages, thinking "they look good, I must get around to finding out how to do those"
Love this! Have a charm pack I must do this with. Thank you! My friend has just made her 2nd ever quilt which was a disappearing nine patch in very similar fabric (moda 12days of Christmas). Very nice! Thanks for the instructions! I made mine with penguins. I have been holding on to some fabric, looking for the perfect pattern – I think this is it! So Cute! Thank you so much for posting this quilt. I just finished a baby quilt using this pattern and it worked out great. Thanks again. I am a beginner… Is there a pattern for this or another visual I can see? Also, do you have yardage notes? This is a great idea! Thanks for sharing . Love this block. I just finished a table runner using this block, it came out great!